The Thai tapioca industry will focus on flour exports and Asian markets as part of its growth strategy over the next five years, when the exports of tapioca products could reach 100 billion baht. The Commerce Ministry projected that by 2016, domestic demand for cassava roots in ethanol production will surge to 13 million tonnes, while exports could top 22.5 million tonnes, totalling 35.5 million tonnes, up 42% from the current production levels. Speaking at the World Tapioca Conference 2011, Yanyong Phuangrach, the ministry's permanent secretary, said Thailand should focus more on exporting tapioca flour to substitute for a reduction in the export of tapioca chips and pellets. The proportion of flour exports is expected to rise to 65% from 51% now, with chips and pellets making up the rest. Mr Yanyong said the country should build a good image and accept the standards of its tapioca flour and other products to create confidence among importers, buyers and local consumers. Thai exporters should also expand in promising markets, especially in Asia countries such as China, India and Indonesia, to ensure flour quality and lower transport and insurance costs. Sharing his view was Pramote Kongthong, president of the North Eastern Tapioca Trade Association, adding that tapioca flour has high potential to be used in food, energy and other industries. He is confident Thailand's exports of tapioca products will exceed 100 billion baht over the next five years. Currently, there is more investment in tapioca flour factories to supply major customers in China and India. Tapioca is a key economic crop for the country, creating jobs and income for more than 500,000 families, with plantation areas of about 6.5 million to 7 million rai. 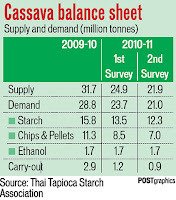 Thailand harvests approximately 20-25 million tonnes of cassava roots each year, 75% of which are processed for export. Last year, the country shipped 7.27 million tonnes of all types of tapioca products worth US$2.15 billion (68.3 billion baht). Seree Denworalak, president of the Thai Tapioca Traders Association, said tapioca exports this year were projected at 73 billion baht, of which 44 billion baht would be tapioca flour. 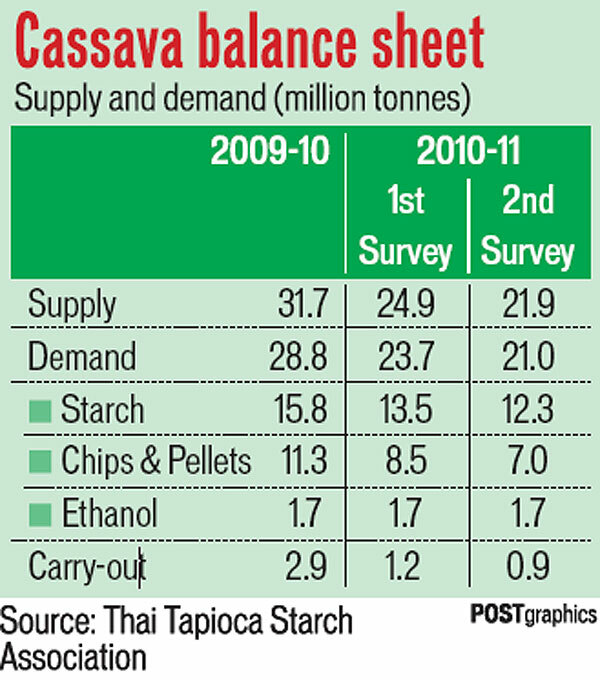 However, the figures may change after a survey on cassava root production in September. TEACHERS and students of Bulileka Sanatan Primary School in Labasa got a shock when a seven-month-old cassava plant bore a 20 kilogram crop. Students from the school uprooted the plant on Thursday. Headteacher Narsamma Naidu said they were thrilled to see such a gigantic crop in their yard. "This is a rare sight and we are really surprised that we have this big crop right here in our school garden," Ms Naidu said. "I asked the garden teacher to dig up a cassava plant for our morning tea because we decided to have tea with cassava this morning," she said. Ms Naidu said they would cook some for morning tea and the rest would be shared among the teachers who were interested. She said the growth of the plant would have to be attributed to soil fertility given the creek that flowed nearby. She said five students planted the crop in December. Center souvenirs Cake Tela Clark held a "Festival Tela Indonesia" (FTI) first in Yogyakarta. Activities that are packed with a variety of creativity, will take place at the Square Puro Pakualaman on July 16 to 17 later. FTI chairman of the Committee, Firmansyah Budi Prasetyo said that this event will be displayed in more than 100 processed foods from cassava and non-cassava. With the purpose of promoting the branding tela as food quality is not inferior to the other foodstuffs. "All this is still viewed tela ndeso products that are less appreciated by the community, especially as they still lay on local food products. In fact, Yogya is the main cassava-producing areas in Java with the production of more than 800 thousand pounds per year," he said on Monday ( 4 / 7). To that end, advanced Word, people should know that the processed products tela which has now grown with different variants of processed food and non food-grade and high flavor. This event will be enlivened by Tela War or the "Cassava War" which will be followed 100 people who are members of various communities. The war in question is using tela already crushed for the smear to each participant. "Cassava War" wants to show it is a struggle to introduce more refined products at a time when Indonesia tela flooded with imported food products, "he said. Event FTI also enlivened by the "Ball Grebeg Tela" tela form of raw materials and other tubers to be paraded from the town square towards Bintaran Pakualaman by Bregada. Arriving at the location, raw materials will be incorporated into processed products tela, which in turn will be contested by the public. "This grand event we hope to be able to break the record Muri with the highest category of processed products initiated Agency for Food Security and Guidance (BKPP) DI Yogyakarta," said Word.